From what I understand, this past weekend celebrated Queen Elizabeth's Diamond Jubilee, which marked 60 years since her ascension to the throne in 1952. 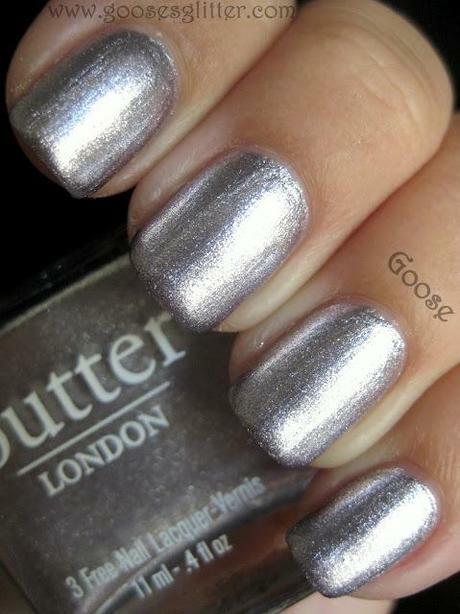 In honor, butter LONDON has created a nail polish shade named Lillibet's Jubilee. Lillibet's Jubilee is a beautiful, bright silvery lilac foil. At first I was disappointed because I thought it was going to contain holo particles, but now that I've tried it I think it's stunning just how it is. What it does, it does very well! The finish is incredibly reflective and eye-catching, and the lilac tint sets it apart from all the other silver foils out there. It also has excellent formula, gliding on perfectly in two easy coats. I don't have anything like this in my collection; all the purple foils I have are darker and not as shiny. Elegant, yet striking. Lillibet's Jubilee and all the other butter LONDON polishes are available on the butter LONDON website, as well as in Ulta stores and at Ulta.com. They retail for $14 each. Lillibet's Jubilee is labeled as a limited edition on Ulta, but I'm not sure since Butter London's site makes no indication.